The Detroit Red Wings defeated the Pittsburgh Penguins 3-2 in overtime in the Wings’ first preseason game on Tuesday night. The Red Wings received some contributions from young players as Michael Rasmussen scored the OT winner, Dennis Cholowski had 2 assists in 23:33 played, and Grosse Pointe native Trevor Hamilton scored the game’s opening goal. The Wings drafted Rasmussen at ninth overall in 2017. A 6-foot-6, 221 pound center who can also play wing, Rasmussen is especially effective around the net. That’s where he played as part of a power play unit with Larkin, Anthony Mantha, Tyler Bertuzzi and defenseman Dennis Cholowski. The unit was the first out in overtime as the Wings had one minute 31 seconds. The Wings called a timeout with 33 seconds left in the power play so the same unit could stay out. Cholowski hit a post and the puck bounced to Larkin, who made a nice pass to Rasmussen just as the power play expired. Rasmussen, 19, is coning off a Western Hockey League playoff run that saw him produce 33 points in 14 games. Starting off preseason with the Wings with a goal is a good shot of confidence. “I thought I played well and now I just have to keep building and getting better,” he said. Trevor Hamilton (Grosse Pointe Farms) and Jussi Jokinen scored for the Wings, Jokinen just 58 seconds after Pittsburgh’s Ryan Haggerty scored at 9:02 of the third period, breaking a 1-1 tie. 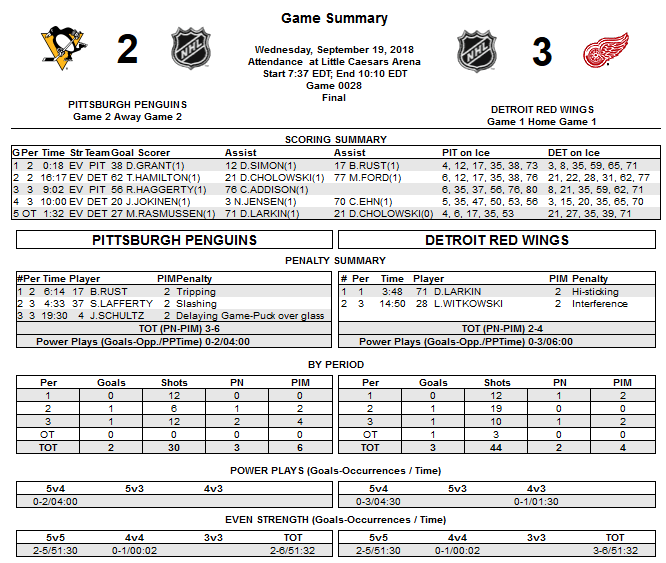 The Red Wings outshot Pittsburgh 43-30 including 19-6 in the second period, when Hamilton scored, tying the score. Though not a Michigan native, Rasmussen will certainly be well-known as a Michigan name for the Red Wings sooner than later. Rasmussen was out on the Wings’ 4-on-3 power play in overtime alongside Larkin, Dennis Cholowski and Anthony Mantha. Though Rasmussen finished the scoring, it was Michigan State alum Derek Grant who opened it, just 18 seconds into the second period. Grant took a pass from behind the net and fired home a wrister at the left circle to put the Penguins up first. Pontiac native and HoneyBaked alum Bryan Rust drew a helper on the goal. Grosse Pointe Farms native and Muskegon Lumberjacks alum Trevor Hamilton responded for Detroit with a shot from the right point through traffic that found the back of the net. Hamilton signed a deal with Grand Rapids after wrapping up a successful sophomore season with Penn State that saw him net 29 points in 38 games from the blue line. Trevor Hamilton: It would make sense for the first goal of the preseason at Little Caesars Arena to be scored by a native Michigander. After all, there are eight Michigan-born players on the current 61-person roster. But if was not one of the usual suspects like Dylan Larkin or Justin Abdelkader. With the Wings trailing 1-0, the Grosse Pointe Farms native shot from the right point, beating Penguins goaltender Tristan Jerry at 16:18 of the second period. Cholowski and Matthew Ford picked up the assists. The game was the first taste of the NHL for Joe Veleno, drafted 30th overall in June. He played with Michael Rasmussen, who was drafted ninth overall in 2017. The two have clicked nicely since playing on a line in the prospects tournament. The first period saw Veleno set up Rasmussen, who put the puck on net. Cholowski, a first-round pick from 2016, took a shot at the rebound from the left point. Cholowski is among the top defense prospects expected to vie for a job, and his ability to get a shot through is something the Wings need. Veleno and Rasmussen played with Justin Abdelkader in the first period, but had Anthony Mantha (a first-round pick from 2013) on line in the second period. The Penguins did not dress their top players, including Sidney Crosby, Evgeni Malkin and Phil Kessel. Derek Grant opened the scoring 18 seconds into the second period on a one-timer from the faceoff circle. The Red Wings face the Chicago Blackhawks at LCA on Thursday (7:30 p.m., Fox Sports Detroit Plus). And MLive embedded a 35-image gallery in Ansar Khan’s recap.